Welcome to the Wasteland. Where all the adults are long gone, and now no one lives past the age of nineteen. Susan Kim and Laurence Klavan’s post-apocalyptic debut is the first of a trilogy in which everyone is forced to live under the looming threat of rampant disesase and brutal attacks by the Variants—hermaphroditic outcasts that live on the outskirts of Prin. Esther thinks there’s more to life than toiling at harvesting, gleaning, and excavating, day after day under the relentless sun, just hoping to make it to the next day. But then Caleb, a mysterious stranger, arrives in town, and Esther begins to question who she can trust. As shady pasts unravel into the present and new romances develop, Caleb and Esther realize that they must team together to fight for their lives and for the freedom of Prin. Wasteland is a world no one would want to live in. The constant hunt for food or fuel, the acid rain, and the fear of the attacks from the outsiders is not the most ideal place to grow up in. Esther is a rebellious kind of a soul, forgoing the jobs of the city in order to spend time with her variant best friend. Things start to happen in the town of Prin that sets everyone on edge and Esther is right in the middle of it. Then, Caleb shows up in town. This mysterious boy from another world pulls on all of Esther’s heartstrings, and soon the two will face the madness of the world they live in, just to survive. For me, this book is one of those books that is a bit hard to review. I liked the story idea, but I didn’t have as much fun reading it as I thought I would. I think my biggest deal with this book was the fact that I couldn’t really get a grasp on any of the characters. The book is written in a way that makes you sit up and pay attention to every detail or you’ll miss something important. While books like that can be amazing, this time around I just wasn’t really feeling it. It was really hard for me to grasp the fact that these kids, fourteen and fifteen, were having children to raise. There is a character that we meet that has a drive to save a kid for most of the book and to me, I just couldn’t wrap my mind around it. Because I already wasn’t sure what was going on at certain parts, that part of me as a reader just didn’t feel sympathetic to the character’s struggles. Does that make me sound bad or what? I have to mention though, the writing was good. Both Susan and Laurence write well. I read that this is their first YA endeavor and from where I stand I can see that. I think parts of the book were just written too different from the typical YA voice and maybe that’s why it threw me off. 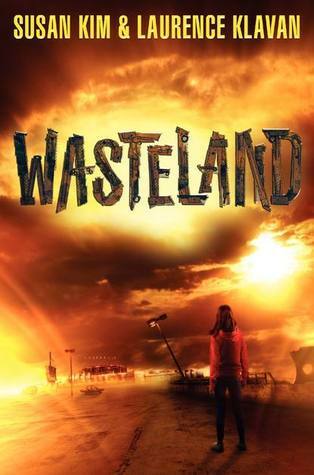 Wasteland is set in a world that is terrifying and real. Both authors did a wonderful job showing the horrors of a land where water is scares and the land is plagued by too many things too count. I’m very on the fence with this book, however I’m interested to see where the story goes. I’m just too curious for my own good I guess. Wasteland comes out March 26th, 2013. Let me know what you think! I never really have enjoyed when two or more authors get together to write one book. For some reasons the voices of the characters never melt together well enough in my opinion. I'm sorry this book was one of those where you have to remember every small detail as to not miss anything. Like you said it sounds like a really interesting story but sounds like it didn't pull it off.